Hello my dear readers! I just wanted to let you know that this guest post is the last post of my blog this year. I’ll be back on January next year. I personally want to say thank you very much for the support, comment, suggestion, and likes on my posts throughout this year. I also want to say sorry if during December I’m inactive do blogging just because I’m on vacation in Paris. Thank you very much. God Bless you all. In the previous guest post (PUTT OFF YOUR EGO) , we understand that every response and our reaction to everything is influenced by the ego. That’s why we must abandon our old human ego, and begin to look at ourselves in the Divine perspective and act in harmony with what God says so that we don’t fall into the sins caused by the ego. To completing that post, let us together learn about conquering ourselves as Paul did while he served the Lord with his whole life. Therefore I do not run like a man running aimlessly; I do not fight like a man beating the air. Paul made an analogy that every Christ’s follower is an athlete in a match. A truly athlete not only exerts his energies, but also invests his entire life to focus on winning in every game. They keen to practice to become more and more expert in their field. They struggle to control themselves: regulate their diet, condition their thoughts and feelings, and often have to overcome their laziness and pleasure. Paul says that all the self-denial they do is for a mortal crown, but we, the spiritual athletes, are fighting for an eternal crown. In the context of 1 Corinthians 9: 25-27, the eternal crown isn’t talking about salvation, but the eternal blessedness which will be a prize to the genuine servants of God and Christ. Isn’t it for eternal blessing we should try harder?! Now let’s see the spiritual life of the Apostle Paul. There are two points emphasized by the apostle Paul, that are “I BEAT MY BODY” and “MAKE IT MY SLAVE”. The body which Paul speaks of in this context is not physical, but the existence of the human self in which there are thoughts, feelings, and will with all its strengths and weaknesses. So, the meaning of “I beat my body” is discipline himself by hardships, handle it roughly like a boxer one buffets his own body. This self-discipline isn’t enough just once but every day, constantly, and for the rest of our lives! Often we angry, hardened, and unwilling to tolerate others. On the contrary, we become weak to face ourselves. We too often surrender to our desires, feelings, and thoughts. Though we know that what we want or what we are doing isn’t good and even wrong, but we are powerless to stop it. If we want to win we must be like Paul. He applied a very hard discipline to himself. He is beating his flesh, defeating his ego, forcing himself to do what he should do, not what he wants to do. Paul disciplined himself very hard like a master to his slave. Being a slave is an unpleasant word. In the days of slavery, a slave had no right to question, deny, and resist his master’s orders. The life of a slave is wholly owned and controlled by his master. Paul says “MAKE IT MY SLAVE”. Paul made himself his slave. In other words, Paul doesn’t allow himself to be controlled by his own will, feelings, and thoughts. Then to whom did Paul subdue himself? To God. Many people want to rise from their downfall and abandon their bad habits, but in reality they continue to do it again and again. They are powerless because they have been enslaved by their own minds, feelings, and wills. Dear reader, if we want to be free and not enslaved by ourselves, then we must subdue ourselves to God. All our existence must be submissive to God like a slave who has no right to himself. An athlete’s struggle has begun since he decided to attend a match, and an athlete’s victory is not only determined when he is in the arena, but is largely determined by his preparations. We are spiritual athletes. Our race starts from the moment we decide to accept Christ as our Lord and Savior. Since then our lives are not ours anymore but belong to God. God is the Master, and we are His servants. The sign that we have made Christ as our Master is if we serve Him, not serving our own desires. Unfortunately, the greatest obstacle for us to devote ourselves completely to God is OUR SELF. All that comes from outside us can indeed affect and trigger, but the final decision remains in our hands. Live in holiness or adultery, be patient or angry, forgive or grudge, faithful to a spouse or an affair, honest or lie, and so on, we decide it. It’s not just about choosing between sin and not, but also about everything that doesn’t support our devotion and service to God, even though it is not evil. For example: praying or sleeping longer, reading the Bible now or later, excessive shopping passion, moody, and so on. Often we have to wrestle with ourselves to make the appropriate choice of God’s will. James said: “But each one is tempted when he is drawn away by his own desires and enticed.” (James 1:14 NKJV) That is why we should not compromise with ourselves but must conquer it under the feet of Christ. To conquer yourself means discipline to say “no” to ourselves to all things that not build our quality of life in Christ, and force ourselves to submit and say “yes” to everything that pleases God as our Master, even if we don’t loved it! 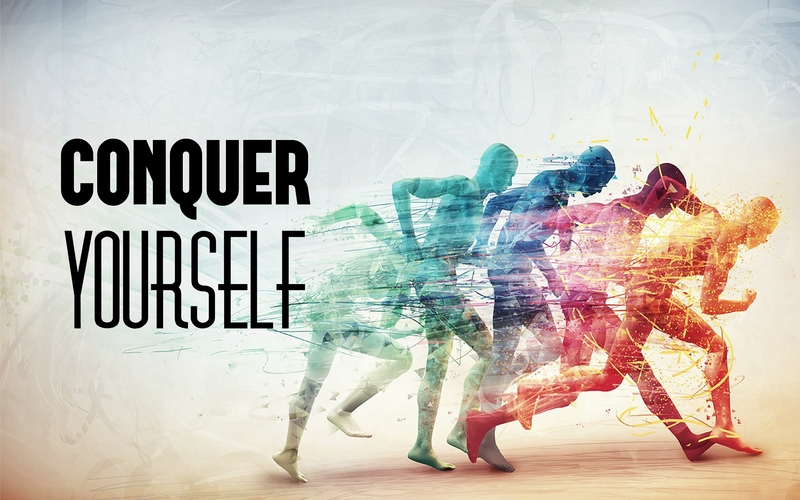 Conquering oneself requires a strong commitment. Not so that we may obtain salvation because salvation is not through man’s work but a free gift from God on the basis of grace. Paul wrote to the Corinthians and to all believers that the purpose of our struggle is: “….. so that after I have preached to others, I myself will NOT BE DISQUALIFIED FOR THE PRIZE.” (1 Corinthians 9:25-27 NIV). If an athlete is disqualified, then there is no longer any chance of winning a prize. When we are “disqualified”, so we will not get eternal rewards from God for all our ministries. How can? For, if we don’t conquer ourselves to God then we will be controlled and enslaved by our own desires. In other words, our master isn’t God but ourselves. The person who is the master of himself, will not be able to serve the Lord because what he serves is his own ego. This thing will be hinder our purity in serving God. God doesn’t see the number of activities in the ministry, but the most important is the transformation of life. Have our lives been in harmony with the gospel we preach? Have we lived righteously as the truths we know? Are we becoming more and more like Christ that we serve? If the answer is “no”, maybe we have not become a true servant of Christ. Maybe we serve because of hobbies, pride, happy to perform, develop talent, love to socialize and organize. All that isn’t wrong. But if we just stop at that stage and do not want to undergo a process of self-conquest that erodes our ego and transforms ourselves, then we can never serve God in the right way and pleasing to Him. Look at the Apostle Paul. In his second letter to Timothy, the last letter he wrote from prison in Rome before he was beheaded by Emperor Nero, he said: “I have fought the good fight, I have finished the race, I have kept the faith.” (2 Timothy 4:7 NIV) Paul was surely believe that he has finished his race very well. It is the hope and purpose of all believers. Dear readers … Before this year’s end, let’s make a commitment and ask the Holy Spirit to help and strengthen so we can discipline and subdue ourselves. If we are always obedient to conquer ourselves under the will of God then our lives will bear the fruits of the Spirit. We will be more loving, able to rejoice even in distress, peace, be more patient, more generous, kinder, more faithful, gentle, and more self-controlling. If the fruit of the Spirit is abundant in our lives, then our ministry will be blessing our neighbor and glorify God’s Name. Until the time comes, we will receive eternal rewards for every of our labor in Jesus Christ. May the last post of this year be a blessing to you, and we will meet next year in a more mature spirituality. This entry was posted on November 27, 2017, in Christianity, Thought and tagged athlete, Christ, christianity, conquer yourself, ego, faith, Faithful servant, fruit of the Spirit, God, Jesus, Life, obedience, obey, Paul, runners, servant, slave.